Denis Smith grew up in Alberta, and that’s where he first played hockey, as told here. 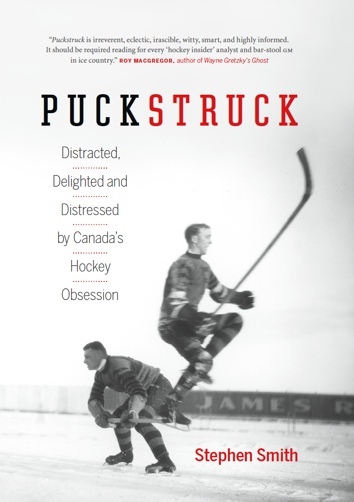 Later he pursued pucks in Quebec and Ontario, and then (as a member of the Oxford University Ice Hockey Club) in England and Italy and Germany and Switzerland. Otherwise, he’s a professor emeritus of political science and former dean of social science at the University of Western Ontario. His books include the award-winning Rogue Tory: The Life and Legend of John G. Diefenbaker and The Prisoners of Cabrera, as well as the novel General Miranda’s Wars: Turmoil and Revolt in Spanish America, 1750-1816. He lives in Ottawa. Once upon a time (almost a century ago in Alberta), there was a cold, cold autumn when the snow never fell. Winter came and there was still no snow. Every morning the sun came up in the east in a cloudless sky (though it didn’t come up until 11 o’clock in the morning, because this was a place in the far, far north) and shone right across the prairies, a thousand miles from east to west and 600 miles from south to north. The sun shone through the cold, cold air, past all the clouds of steam that were made by all the people breathing out into the cold, cold air. When you looked down from above, you could see little puffs of white, steamy breath shining in the bright sunlight all the way from Winnipeg to Fort Whoopup on the Belly and beyond. Sometimes as they dawdled, the jokey ones would blow steam rings, and steam spirals, and steam skyscrapers, and those would drift high up into the cloudless sky. And since there were no real clouds, those strange shapes became the clouds that could be seen drifting slowly across the prairies: giant doughnut shapes, and curlicues, and spires. The birds flew in and out among them chasing one another from dawn to dusk (that is, from 11 until three, when the sun went down in the far, far north where we lived). And slowly, in the darkness, the shapes all faded away, leaving a clean blue sky to greet the sun when it came up the next morning. Anyway. Here we were in our cars, driving west with the sun as it followed low behind us, on an early Saturday morning, to Lake Wabamun. When we got there what a sight we saw before us! From Kapasiwin in the east to Seba Beach in the west, there was solid ice for 14 miles, all smooth and shiny and bluish-white in the sunlight, without a single bulge or crack or pile of snow because there was no snow anywhere that winter. At the top of the hill above the lake we scrambled out of the cars with our dogs and our scarves and our skates and our mitts and our toques, and tumbled down the footpath in a great rush to get to the shore. The dogs followed us, ran in and out among us, and sometimes tripped us up because they, too, were excited about what they saw (even though they saw the lake in black and white while we saw it in colour). We had our hockey sticks too (didn’t I say that? ), which the best-trained dogs among us carried down to the lake in their teeth. At the shore, our fathers and mothers and aunts and uncles and next-door neighbours built a roaring bonfire, and unpacked hotdogs and buns and hamburgers and ketchup and doughnuts for lunch, while we sat scrunched close the fire to put on our thick spare socks and our CCM skates. And then we put on our toques and our mitts and sped out onto the ice with our sticks and a dozen pucks. We circled each other in huge arcs and short loops, making beautiful patterns in the ice, and shot the pucks at each other and high into the trees on shore, where our parents sometimes retrieved them and sometimes didn’t. When everyone was on the ice (parents too, except for those who stayed behind to cook), we picked teams. 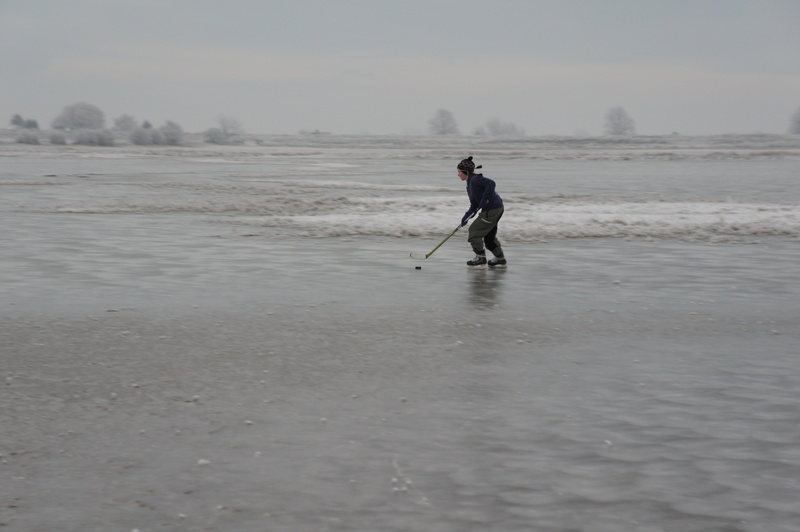 This was before anyone anywhere had ever before played a game of pond hockey. (Well, it was a little bit later than the McGill—Harvard game: but they had uniforms and snow packed around the edges of the rink and goal nets and a referee, so that wasn’t pond hockey at all). So we were the first, on that lake in Alberta almost a century ago, when the ice was clear for 14 miles, almost right over the edge of the horizon if you looked at it from ice level, which we often did when we fell down. I was a Poplar Leaf, and our goal was on the Kapasiwin shore. The other guys (and girls, because when pond hockey began that day it made no difference whether you were a guy or a girl and there were good skaters and stickhandlers among the girls, though some of them wore figure skates and just did fancy turns and never touched the puck at all), the other guys, I was saying, had their goal far out on the lake, maybe two miles away off the first point at Fallis across the bay. To start with, we faced off at our end, while their goalie and defencemen set off skating down the lake to the other end of the ice. They weren’t happy about that, because the action got further and further away from them. At our end the game was frantic. Our goalie couldn’t cover the space between the posts because it was 12 feet wide to match the length of the ice and he didn’t skate too well. The Spruce Needles kept scoring, goal after goal. By lunchtime the count was 17-0, and we hadn’t even had a shot on goal. So we glumly ate our hotdogs and devised a plan. At the face-off each of us on the Poplar Leafs had an extra puck in his/her mitt. When the puck dropped, our centre-ice man Fred won the face-off and skated away fast to the west. The other seven of us followed, spread out widely across the bay (I forgot to say each team had nine players) leaving only our goalie, “Legs” Braithwaite, behind. We skated and skated, following Fred and the puck, and finally saw the Spruce Needle goal in the distance. There was no sign of their defencemen and goalie: they had gotten hungry on the way and gone ashore at Fallis for an afternoon snack. Fred fired a shot from a half-mile away and hit the goal straight on in the middle. 17-1. The other seven of us dropped our pucks when we got closer in, and fired again and again. 17-6. (Two of us missed on the first shot.) We picked up our pucks and fired again and again and again and again and again. 17-10…17-12…17-15…. And before long we were tied, 17-17. Just then the Spruce Needles’ left defenceman, Smarty Brown, caught up to us and knocked Fred down from behind and sat on him as he was about to fire the winning goal. We voted eight to one for a penalty shot. Fred got up slowly, skated a wide circle of a few hundred yards, picked up the puck 20 feet out, skated in close, did another fancy pirouette and fired a rising shot into the empty goal. 18-17 for us! We all fell down in joy and exhaustion, and at three o’clock the sun went down beyond us on the western horizon as we turned back to the east, where dogs and parents awaited us, crouched low on shore around the blazing bonfire. That was the day we invented pond hockey, at a long lake in Alberta under an immense sky when there was no snow and the ice was smooth for 14 miles and the days were short and the Poplar Leafs first defeated the Spruce Needles. There has never been another day like it. Fred became famous later in the century when he was the first NHL player to score 11 goals in a single game, with no assists, which was not as many as the 12 he scored that day. When he retired from hockey he opened a gas station in Medicine Hat and became rich. The rest of us played on for a while, but never again on a day like that one.